Indigo is a dyestuff known for its blue hue. The color comes from indigotin, a dye derived from the glucoside indican found in some fifty related plants, mostly in the leaves. Of these, Indigofera tinctoria, native to India, has the highest concentration of indican that makes deep, dark blues practicable. Less well-endowed varieties grow in Mexico and South America, Europe, Egypt, West Africa, Sumatra, Central Asia, China, and Japan where from ancient times they were used, it is thought, with varying degrees of influence from India. Woad (Isatis tinctoria) was used as a blue dye from as early as the fifth century B.C.E. in Europe where a textile fragment from a Celtic grave has been verified as having been dyed with this source of indigotin. The East India companies introduced indigo into Europe in the 1500s; although Europeans recognized its virtues, they outlawed it because it threatened economic disaster to their woadbased economies. Separating indican, the basis of the dye, from the rest of the plant and changing it into indigotin, the dye, was a laborious undertaking begun by fermenting plant material in vats of water. One hundred pounds of plants yielded about four ounces of the insoluble, granular blue precipitate called "indigo," containing from 10 percent to 80 percent indigotin. The best came from Bengal. Spices and calico were the focus of the India trade, but traders established hundreds of indigo plantations in the East Indies to supply the growing demand. The Spanish introduced indigo production to Central and South America and the West Indies, where it flourished. In America, the English colonists found indigo to be a lucrative crop, and during the difficult period of the Revolution, for lack of stable currency, lumps of indigo served the purpose. Supplies of processed indigo dyestuff are nearly nonexistent in the early 2000s because its manufacture is labor intensive and expensive; there is little profit in it now that synthetic indigo prevails. Unlike madder and most other natural dyes, indigo permanently attaches to fibers, particularly cotton, without mordant (a chemical that fixes a dye). Silk, wool, linen, and cotton may be successfully dyed with indigo. The dyestuff, however, cannot simply be stirred into the vat because indigo is insoluble. This property confers permanence, but carries the challenge of getting it onto the cloth in the first place. Undissolved indigo does not adhere to fibers. The purchased chunk must be laboriously ground to a very fine powder and placed in a vat of water containing an agent to reduce, or chemically remove, oxygen molecules from the indican suspended in the liquid. 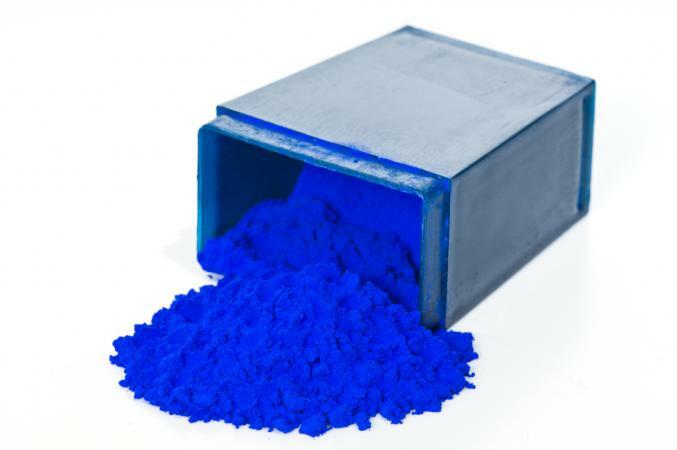 The color of the indigo then changes from blue to a near white known as "indigo white." In this state the indican may be dissolved, but only if the liquid is alkaline. 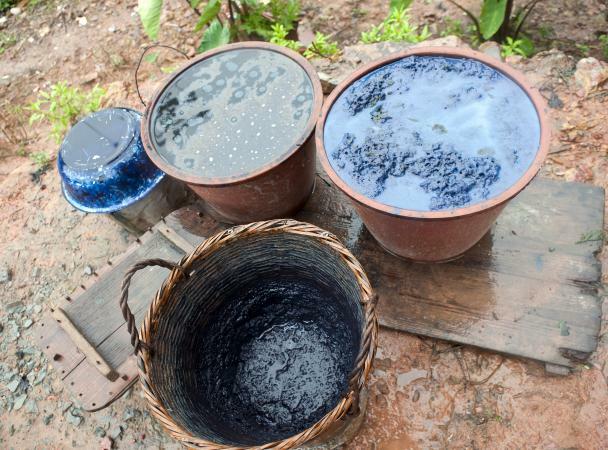 The art of indigo dyeing lies in maintaining the vat in a state of balance between reduction and solution in such a way that the cloth is successfully dyed without suffering alkali damage. The earliest method of reducing indigo was to induce fermentation by the introduction of vegetable matter such as seeds into the vat. Later, woad, bran, or madder were used, but the fermentation vat was slow to "come on." Because it was effective and worked faster than fermentation, orpiment (arsenic trisulphide) came into favor although it was a deadly poison. When ferrous sulphate, or copperas, was found to work better and safely, it became the reducing agent of choice. Toward the end of the nineteenth century, a form of glucose was preferred. For all of these methods, lime was added to the vat to raise the alkalinity sufficiently to allow the white indigo to completely dissolve. The well-known urine vat was best suited to dyeing on a domestic scale; fermenting nutrients in the urine simultaneously generated a reducing and an alkaline solution. As dyed cloth is removed from the vat, atmospheric oxygen immediately combines with the white indigo to restore the insoluble blue form again, thereby fixing the color mechanically within and upon the surface of the fibers and forming a weak chemical bond. If the dye is not completely reduced, it is not completely dissolved, and in that state cannot adhere to the fibers. An excess of undissolved-hence, unattached-indigo would crock, or rub off. The deepest shades of blue are achieved by successive dips so that the color will be even and rich. The Indians are recognized as the originators of resist dyeing with indigo, accomplished by applying wax to protect the cloth wherever it was not to be colored blue, even if that meant most of the cloth. The Japanese and Indonesians employed tie-dye and clamping techniques to resist indigo. Europeans developed a resist paste made of starch mixed with copper or lead salts that were best applied by block. Discharge pastes that bleached or removed the blue color to make white designs came into use on indigo in the 1820s. These were more suitable than resists for cylinder printing. Resist and discharge pastes bearing mordants or lead salts for chrome colors were later developed, permitting the incorporation of colored shapes neatly fitted into the blue ground. Obtaining a white ground with fine or small blue designs posed a problem. To do so, "pencil blue" -indigo mixed with lime and orpiment-was applied like water-color with a brush or "pencil." Variations called China or Fayence blue were repeatedly revised for block and cylinder printing, but never produced a very dark or even color and usually gave trouble. Adolph von Bayer first synthesized indigo in 1880, but it was not until the end of the century that a commercially viable process became available. The synthetic indigo was chemically identical to the natural form, minus the organic impurities. It was very much cheaper and little reason remained to resist; by 1920, natural indigo was little more than a memory in commercial print works. The efficiently aggressive East India traders launched the final three hundred years of intensive commercial exploitation of all aspects of indigo production. By 1900, the venerable role of the "drug" that had shaped cultures and ages was usurped by a distinctly unromantic, synthetic replacement. The ubiquitous blue jeans of the early 2000s testify, undaunted, to the endurance of a global heritage called "indigo blue." Natural indigo is used only by artisans producing special custom yarns and fabrics. Most distinctively, the Japanese continue to employ ageold tie-Resist Dyeing, and stencil techniques to make masterful indigo-patterned fabrics for kimonos. See also Dyeing; Resist Dyeing. Irwin, John, and P. R. Schwartz. Studies in Indo-European Textile History. Ahmedabad, India: Calico Museum of Textiles, 1966. Liles, J. N. The Art and Craft of Natural Dyeing. Knoxville: University of Tennessee Press, 1990. Pettit, Florence. America's Indigo Blues. New York: Hastings House, 1974. Sandberg, Gosta. Indigo Textiles: Techniques and History. Asheville, N.C.: Lark Books, 1989.